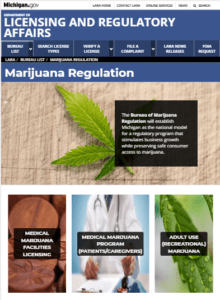 The State of Michigan has launched “Accela”, Michigan’s medical marijuana card online application portal. If you are a new or renewal Healthy Partners patient and do not have a caregiver, you can submit your application for your Michigan medical marijuana card online. Submitting your application through Accela can significantly reduce the amount of time required to process your application. This means that you’ll receive your card in faster! The Accela portal is managed by the State of Michigan. If you have questions about Accela or how to use Accela, please contact the State of Michigan at (517) 284-6400, or [email protected]. To get started, you must first create an account in Accela. To do so, click here and follow the instructions. Although the instructions for creating your account in Accela appear lengthy, the process should take only a couple of minutes to complete. You will still need to have an in-person examination with a Healthy Partners doctor. You can schedule an appointment by clicking here. Once your account in Accela is created and you have had your appointment with your Healthy Partners doctor, you can submit your application online. Submitting your application online is actually quite simple. Just follow these brief instructions. Again, please contact the State of Michigan at 517-284-6400, or [email protected] with any questions. If the links above do not work, try these, or copy and paste the links below into your browser address bar.